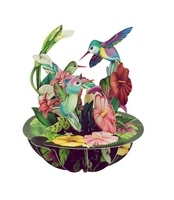 More Info: This incredibly unique 3D pop up greeting card design features die cut illustrations of vibrant colored hummingbirds floating above red, pink, white and yellow flower. 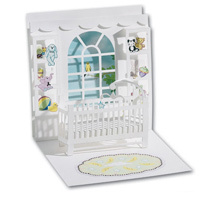 Opening the card reveals multiple layers of artwork that overlap to create a wonderful paper sculpture. 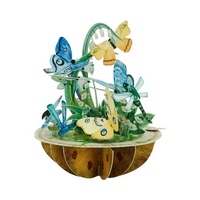 Part of the ‘Pirouettes’ line of greeting cards, the spherical design at the base of the card allows the design to rock and spin a full 360° making it a truly collectible gift that will be treasured and displayed long after it has been received. The card measures approximately 5.25 x 7.25 inches when fully opened and folds flat for mailing in the 5.9 x 7.7 inches ivory envelope. No assembly required. 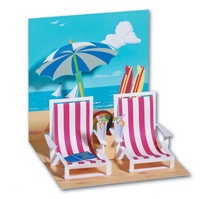 Includes space to write your personal message on the base of the greeting card. 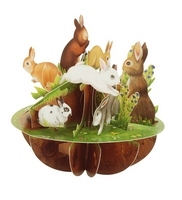 More Info: This incredibly unique 3D pop up greeting card design features die cut illustrations of brown, white and gray rabbits eating and playing in tall grass and flowers. 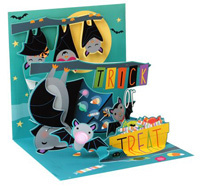 Opening the card reveals multiple layers of artwork that overlap to create a wonderful paper sculpture. 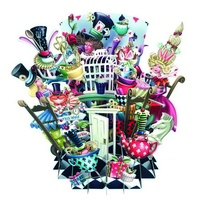 Part of the ‘Pirouettes’ line of greeting cards, the spherical design at the base of the card allows the design to rock and spin a full 360° making it a truly collectible gift that will be treasured and displayed long after it has been received. The card measures approximately 5.25 x 7.25 inches when fully opened and folds flat for mailing in the 5.9 x 7.7 inches ivory envelope. No assembly required. 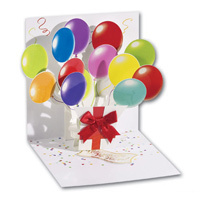 Includes space to write your personal message on the base of the greeting card. 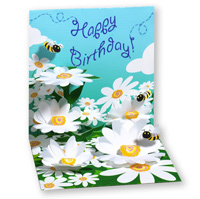 More Info: This incredibly unique 3D pop up greeting card design features die cut illustrations of blue and yellow butterflies and purple and green dragonflies hovering over green reeds and white and yellow flowers. 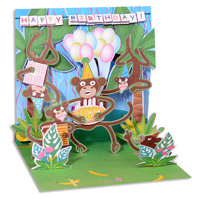 Opening the card reveals multiple layers of artwork that overlap to create a wonderful paper sculpture. 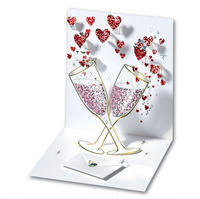 Part of the ‘Pirouettes’ line of greeting cards, the spherical design at the base of the card allows the design to rock and spin a full 360° making it a truly collectible gift that will be treasured and displayed long after it has been received. The card measures approximately 5.25 x 7.25 inches when fully opened and folds flat for mailing in the 5.9 x 7.7 inches ivory envelope. No assembly required. 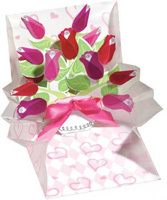 Includes space to write your personal message on the base of the greeting card. 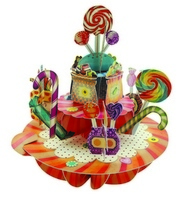 More Info: This incredibly unique 3D pop up greeting card design features die cut illustrations of an assortment of candies including suckers, whirly pops, candy canes and more. 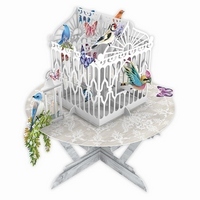 Opening the card reveals multiple layers of artwork that overlap to create a wonderful paper sculpture. 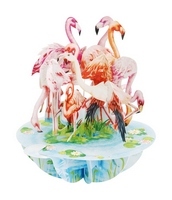 Part of the ‘Pirouettes’ line of greeting cards, the spherical design at the base of the card allows the design to rock and spin a full 360° making it a truly collectible gift that will be treasured and displayed long after it has been received. The card measures approximately 5.25 x 7.25 inches when fully opened and folds flat for mailing in the 5.9 x 7.7 inches ivory envelope. No assembly required. 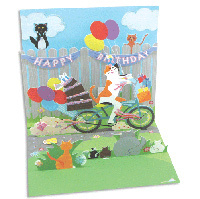 Includes space to write your personal message on the base of the greeting card. Inside: Birthdays are like workouts… the higher the count, the harder they get. Happy Birthday! More Info: This funny Avanti birthday card features a die cut image of a sparkling 'Fabulous Forever' night club marque that 'pops up' when you open the card. Made in the USA. Printed on Recycled Paper. 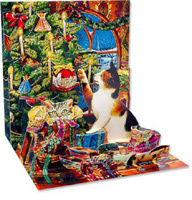 More Info: This unique 'Message in a Bottle' 3D pop up greeting card features 6 panels that swing open to reveal detailed illustrations of two cats pawing at a field of white and yellow flowers while blue, orange and yellow butterflies float above the ground. The intricately laser cut illustrations are framed inside a deep blue bottle shaped design that stands on its own when fully opened allowing the card to be displayed long after it has been received. The card dimensions are 8.25 x 3.0 x 4 inches when opened. A large white area on the back panel will allow you to add a personal message. No assembly required. Folds flat for mailing. Measures approximately 9.75 x 4.0 inches when flat. Made in Ireland.Perfect for any occasion including birthday, anniversary, thank you, thinking of you, Mother's Day or just to say 'I love you'. Inside: Happy Birthday …and all that cheesy stuff! 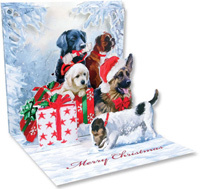 More Info: By folding the front panel of this unique Christmas card a 3-dimensional image 'pops up' and the row of snow covered houses appears to be at the top of a snow covered hill. The card features die cutting and a center fold on the front panel to allow a portion of the artwork to extend out from the card. Glitter embellishments on the homes and in the light beams add a wonderful sparkle to the artwork. Inside: Merry Christmas and best wishes for all good things in the coming year! 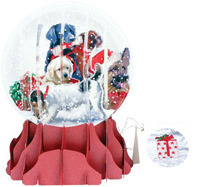 More Info: The artwork of Shelly Rasche is featured on this wonderful 3-D 'pop up' Christmas card that has die cutting and a center fold on the front panel that allows each portion of the Christmas tree 'pop up' in alternating directions and create a unique 3-dimensional effect. Glitter embellishments on the stars and candles create a wonderful feeling of twinkling lights.